Fun things to do with Robbie never occur to me quite like they do to Micah and Allie. I guess as the mom, I’m not supposed to be the fun one all the time. That’s part of the excitement of going to see CaCa and Allie; Robbie can do things there that he can’t at home. And tonight was no exception. Because I forgot to bring dessert tonight, CaCa and Allie were forced to think on the fly. Allie, sweet woman that she is, suggested letting Robbie bake cookies. So, they brought out the step ladder, washed his hands, and got to work. 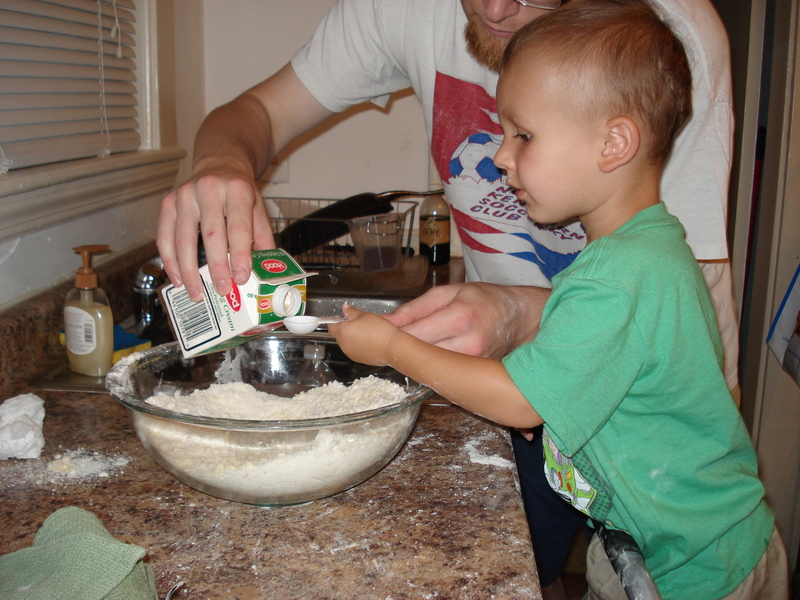 Robbie stood on the step ladder, pouring ingredients and stirring enthusiastically. Sometimes with a little too much vigor, much to the delight of the two dogs resting in close proximity. And then came the big time: stirring in the wet ingredients. Robbie held his teaspoon steady for the milk and then the vanilla. And, because he’s two now, dumped the broken egg into the mix – taking special care not to drop the shell in. Like any good parents, Justin and I dutifully schlepped Robbie down the street for his two-year check-up this morning. I started talking about the doctor early in the morning, so, by the time we strolled up to the building, Robbie was yelling, “Oh, boy! Doctor!” And, I’ll be honest, that kind of concerns me. But, as long as he’s excited about seeing the doctor and not playing one, I think we’ll be OK.
Robbie was all laughs and fun while playing in the waiting room (where was the cool playhouse and cars when I waited for the pediatrician and why don’t they have this stuff for adult waiting rooms?). But this all came to an abrupt halt when Aaron the nurse called us in to the exam room. Robbie took one look at the man and burst into tears. You know, the ear-splitting-glass-breaking-tears? Yeah. Those. He screamed through having his head measured (19.5 inches), his body measured (an estimated 36.5 inches, give or take a thrashing limb), and his weight taken (a whopping 28 pounds, 6 ounces). He calmed down for a minute between strangers in the room and then started his craziness when Dr. Sheldon came in. At first, Robbie refused to look at her, preferring to play with the door and open cabinets. All while dressed modestly in his diaper, mind you. Eventually, he came around, sharing his favorite words and busting a few dance moves. Classy kid, I tell you. Dr. Sheldon got down to business, and finally started checking up on the kid. He screamed while she listened to his heart and lungs. He nearly bit her fingers off when she checked to see if his two-year molars were coming in. And he flipped out when she got to his ears. You guessed it. Ear infection. Double, actually. Oh, they weren’t raging infections yet. But, given my parenting expertise, they probably would have been around 2:45 tomorrow morning. Or, even worse, 2:45 Sunday morning. After all, there are office hours on Saturdays – but not Sundays! Fortunately, this was a Friday and the infection was detected before it got too terrible. We left the office armed with an Elmo sticker and an amoxicillin prescription. Not bad for a day’s work… And you know what? As the day wore on, Robbie started talking about his booboo – and pulling his ear. So, maybe we would have figured it out, but it’s so much easier this way. I never pictured myself the type of woman to freak out about a birthday cake, and I’m embarrassed to admit to you that I have become that person. Yes, friends, I got angry over a birthday cake. Not quite where I could feel my blood boil, but it was definitely simmering. I’d carefully made my way through the grocery store, making sure to keep the cake in the middle of the box. It was a perfect Sesame Street cake, with Big Bird and Elmo driving down a highway of icing. We made it all the way to the check-out and through the scanner. And then it happened. The cashier bumped the cake, causing a roll-over of Big Bird proportions, right into the middle of the blue sky. I insisted a manager come to the lane and get it fixed. And then it happened. The hateful woman move. The actions of a woman who has company coming in an hour, hasn’t seen how clean her husband has gotten the house, and has visions of a ruined birthday cake that will destroy the entire party. I’ve thought for months about how I wish I could be a gracious person in any situation. Like Justin’s aunt, who welcomed us into her house at 10:00 at night without any notice. Like Allie, who immediately agreed to pick up Robbie at 5:30 in the evening because I was delayed skydiving. And here was my opportunity. While the cake was being fixed, Cecil looked at me an apologized for messing up the cake. I could have said, “No problem! It could have happened to anyone, and it’s being fixed now.” I could have. But I didn’t. I snapped, “Well, you have to be careful with cakes.” And sounded like that disdainful mother whose child you feel sorry for. As soon as the words were out of my mouth, I regretted it. Of course, the store was busy, so there was no immediate opportunity for me to apologize. I did, though, right before we left with our now-perfect cake. I still feel terrible for the way I handled the situation, but at least I attempted to make it better. I’m sure you’re waiting for the twist. There’s always one in my life, right? Well, for Robbie’s birthday, we had the neighbors and their kids over along with Micah and Allie. We made it through hamburgers and hot dogs, the adults mostly getting time to talk to each other (about poop, of course; after all, this was a child’s birthday party). All of a sudden, there was a struggle in the middle of the yard. Nick, our neighbor, had his daughter in one hand and was wrestling a cake box away from Robbie with the other. Yes. My perfect Sesame Street cake had been pulled from the table to a cake-deprived two-year-old. The poor child had been begging for cake since he woke up at 9:00 this morning (you read that right – we slept until 9:00 this morning!). And there it was, within his grasp. And destroyed. Big Bird took a header off the corner of the cake. Icing was all over the box. And, of course, I hadn’t gotten a picture of the cake in it’s state of perfection. But I think I’ll take a destroyed birthday cake over a pristine one any day of the week. Especially if it means that my little boy is so excited about his birthday that’s all he can think about. Thanks for checking in! I’ve recently moved my blog to shesoneofthosemoms.com. Please come visit! It might make me the worst mother in the world. Maybe the worst wife. But I did it anyway. I jumped out of a plane. From 8500 feet. On purpose. Now, I’ll be honest. Skydiving has always intrigued me. You know, in the what-kind-of-fool-would-throw-himself-out-of-a-plane-and-plunge-to-the-ground kind of way. The idea of flying like a bird sounds great. Hurling myself out of a metal tube that far off the ground to get to the flying? Not so much. But then there was a Groupon deal. And friends who wanted to use it. I don’t like to be left out – even if it means doing something stupid like attaching myself to a total stranger, hoping a flight, and jumping out into the clouds. So, this was no exception. I’m not entirely sure that I can do justice to describing what this is like. A friend told me the worst part was the flight up, and that’s so true. I just wanted to do it. Get to the point of no return. I didn’t want to wait for it. So it would only make sense that I would be the first of my friends to be thrown from the plane. I know, I know. You think you actually jump, right? Not so much. I’m sure it’s that way if you’re jumping on your own, but I had a lovely man named Dave strapped to my back. Dave had me crouched down with my toes hanging over the door of the plane and my arms crossed on my chest. And then he threw us out of the plane. As I had been told, I arched my back, flexed (or was it relaxed?) my hips, kicked my feet up, and stuck my arms out. Oh, and plummeted toward the ground. It didn’t feel like falling, though. It was flying, pure and simple. I flew through the clouds, and time seemed to stand still. For about 45 seconds before Dave thoughtfully pulled the rip cord, which threw us back up into the sky like an untethered bungee cord. As we slowed in our descent, Dave handed the controls over to me. I didn’t do anything too crazy, but it was pretty awesome to feel in control in such an uncontrollable situation. Dave spun us in circles and then gave me a tour of the area, pointing out Boston in the distance. Are you kidding me? I saw Boston from 45 miles away! And landing? Not nearly as bad as I would have thought. I just sat down in the air, and, next thing I knew, I was sitting down on the ground. Anyone want to go jump? Count me in! Funny how a year changes things. This time last year, I was rocking Robbie excessively, afraid to put him down in his crib. Because I knew that it was the last time I would hold him as a baby. I desperately wanted to stop time and cuddle my baby. Tonight? I just wanted him to go to bed. By the time we got home tonight, it was nearly 8:00. There was still dinner to conjure (fortunately, Robbie was satisfied with cereal mixed in with yogurt) and bath time to survive. By the time Robbie threw a bucket of water onto the floor, I was ready to lose my mind. Fortunately, there was no real time for that because I was too busy trying to keep my balance amid flailing limbs on the slippery tile. I’m going to admit it because, well, we’re all friends here. I dumped water over Robbie’s head, scrubbed him down, and dumped more water to rinse him. He was crying and I was trying not to. And then bath time was over, with my child wrapped up in a towel. Do you know what he had the nerve to do? He put his head on my shoulder, wrapped his arms around my neck, and told me he loved me. Which melted my heart, until I slipped and nearly broke my neck on some unseen water from the earlier incident. They used to be fun, didn’t they? You know, in college? When you were up all night studying with sorority sisters? Or the cute guy in your Ancient Greek and Roman Art class? Or, more likely, out drinking all night and not sure how you’d get home? Or even if you’d get home? I would have killed for one of those last night. Instead, I got the life-after-we-decided-to-uproot-our-lives-with-a-child all-nighter. It started innocently enough, with Robbie waking up hungry around 11:00 when Justin was, ironically, cooking dinner. It must have been the scent of rice boiling that wafted up the stairs, tickling my toddlers nostrils. When I brought him downstairs, all he could talk about was rice, melon, and cheese. Which is precisely what he proceeded to eat. It should have been easy enough. Feed the child. Cuddle the child. And send the child packing. But not my kid. Oh, no. He suckered me. I’m not a novice. I should have seen through the pitiful cries after I put him to bed. I should have stayed strong. But he just sounded so pitiful. And who was I to sleep in my soft, fabulous bed while he wailed from his crib? So we watched The Smurfs. And The Berenstein Bears. And maybe an episode of Sesame Street. By 12:30, I’d had enough and attempted to persuade my toddler that the Smurfs, the Bears, and Elmo were all tired from playing with him and had gone to bed. I tried to convince him that he, too, needed to get some sleep. Robbie responded with an enthusiastic jump onto my back, squealing with delight when I picked him up. And then screaming in horror as he realized I was placing him in his crib. Don’t worry. I didn’t fall for it again. I left him there. For fifteen minutes. Until Justin, who actually heard the screams from downstairs, came up to console our poor child. And. Then. Brought. Him. Back. I heard the door open and mumbled, “You fail at parenting.” Confused and obviously assuming I was talking in my sleep, Justin asked for clarification. Rolling over, I told Justin that, once again, he’d played the role of sucker, hoping this would convince him to deposit the child back in his crib. No such luck. He cuddled with Robbie until the cherub fell asleep and then placed him in between us. Let me assure you, Justin and I have very different ideas about the success of this move. In our queen-size bed. For Justin, he loves to cuddle with Robbie and sleeps perfectly. This is because the two of them sleep with their backs to each other. For me, it’s a nightmare. Robbie kicked me in the back until 4:00 this morning when I finally took him back to his crib to sleep. And, yes, he started screaming as soon as I laid him down. I’m not sure when he stopped; I shut our bedroom door and put the air conditioner on high. It’s started. We knew it was coming. But tonight, it happened. The climbing. Oh, the climbing. Sure, we’ve seen him life his legs up and pretend to pull himself up on his crib. But nothing like this. And I have a feeling that life as I know it may be over soon. Very, very soon. I was in Robbie’s room putting laundry away, having left him on the other side of the gate. It’s an average gate. One you’d find at Target (which, incidentally, is where I found it) or any garage sale. You know, it has the bar that goes (stupidly) horizontally across the front? The bar that just invites a child to climb up on it with both feet, balance himself, throw his hands in the air, and yell, “Tada!” The bar that gets him just close enough to the top to throw his leg over and shimmy down to the other side? Yeah. We have that gate. On three different doors. And don’t you for a minute think that he didn’t do the same “Tada!” routine on every single gate. I suppose there is good news, though. After all, the companies weren’t stupid enough to put that damn bar on both sides of the gate. Every day I make Robbie repeat the same sentence several times. “I. Will. Not. Spit.” Variations may include “food”, “at the dog”, “on Daddy/Mama/any other individual in spitting range”. But none of it really seems to work. Robbie repeats what I ask him to repeat. He gives me the obligatory, “Sowee.” And then he spits again, with that gleam in his eye. Sometimes, if I seem really angry, he avoids eye contact for a few minutes and then offers a sweet smile. How do you deal with spitting? It’s not like I can take anything away from him (which is what I do when he throws things). Spanking seems too severe. Time outs don’t appear to do much good. And spitting back, while extremely tempting, is just gross. Maybe ignoring it is the way to go? Hoping he’ll stop if he doesn’t get attention? And do girls even do this?